The Mystery of Morrish & Co. It all began when I was examining a dress and jacket suit recently accessioned to Walsall Museum’s Community Costume Collection. 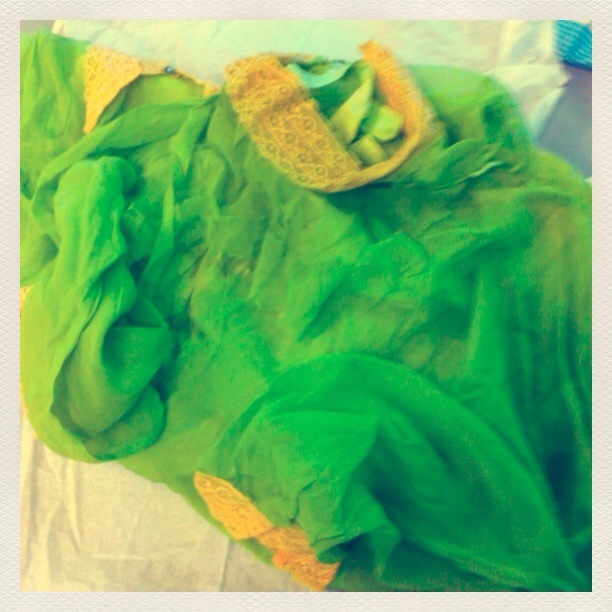 It was a green crepe ‘sunday best’ style outfit, with a cheery pink rose print. It is from late 1950s or early 1960s (though I could do with doing a bit more research to confirm this). In my more fanciful moments, I can picture Edith or Flora Hodson wearing it whilst bustling off to church or to some family occasion. 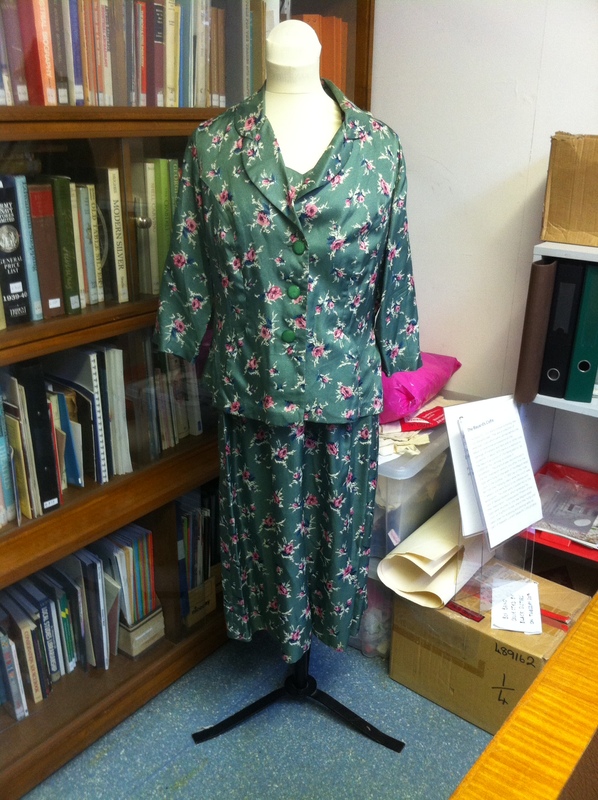 The green and pink floral ‘Sunday Best’ outfit found in a wardrobe at 54 New Road. Sheila Shreeve found the outfit in a wardrobe at 54 New Road (the property was both the family home and business premises) and there had been some discussion regarding the relationship between the ensemble and the Hodson Shop Collection. 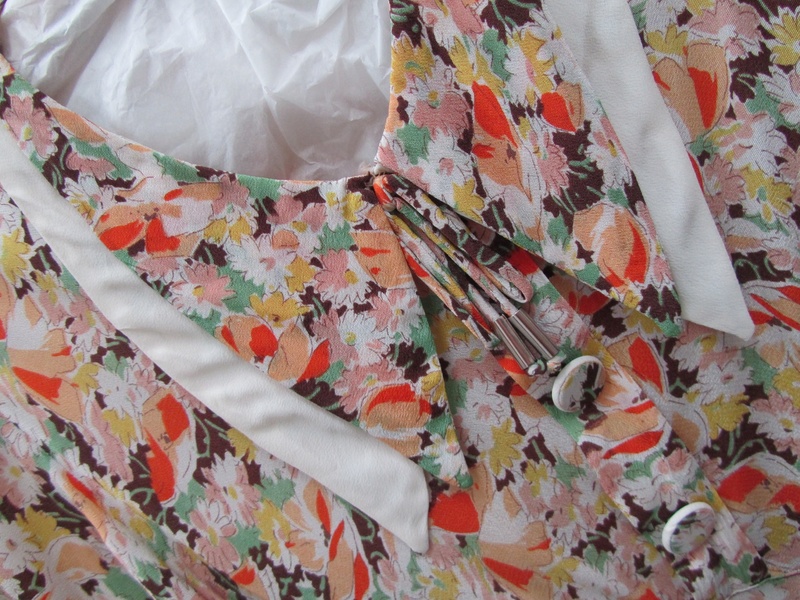 The outfit has some very clear signs of wear – soiling around the neckline, evidence of altered hems and repairs and there is even a brooch pinned to the right hand bust. 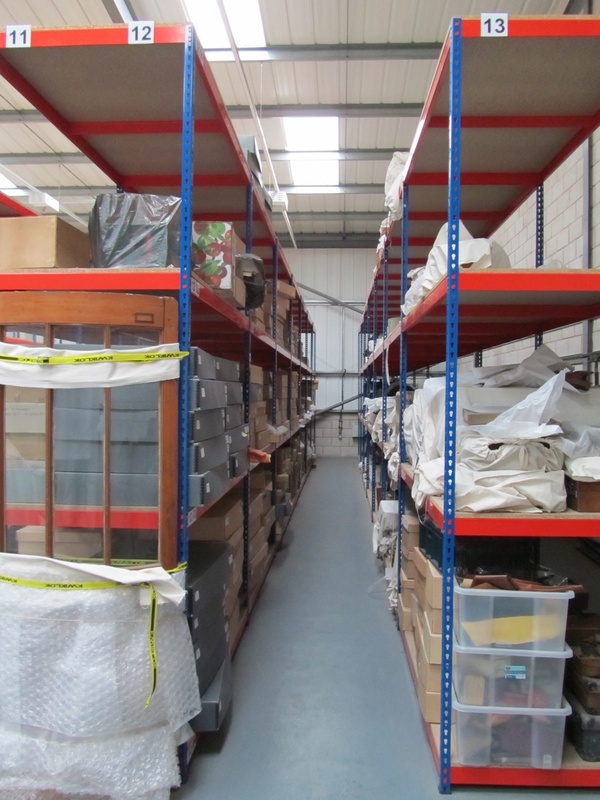 The Hodson Shop Collection is defined as unworn shop stock, with ‘unworn’ being the operative word in this case. Based on the evidence of wear, the outfit was ultimately accessioned into the Community Costume Collection with a note making the relationship to the Hodson Shop clear. This is where I went wrong. Based on my own experience of clothing labels, I assumed that Morrish were the manufacturers of the outfit. 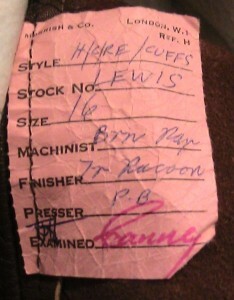 After all, the labels in modern clothing always give the name of the manufacturer, right? This is where the Prownian approach (description, deduction, speculation) to analysing garments proved to be most valuable. It was time to test my hypothesis! 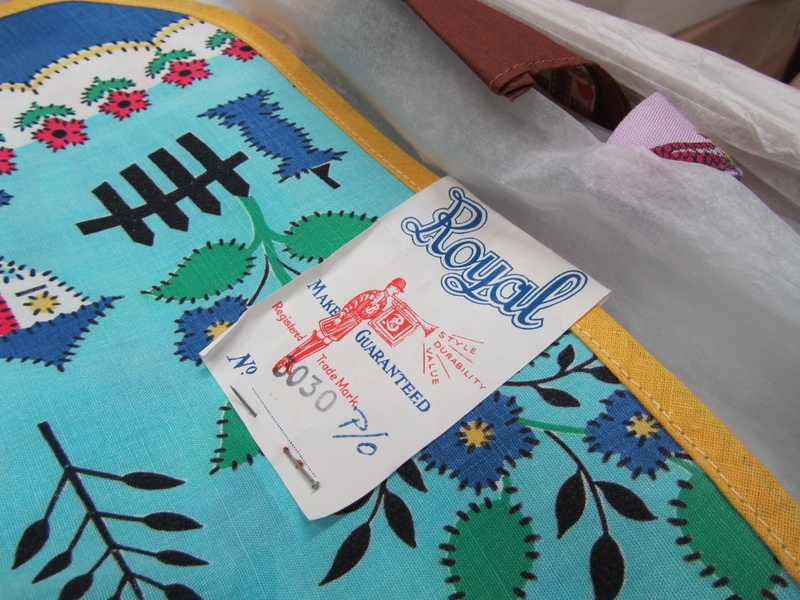 It has a paper hand written label sewn into a seam – what does that indicate? I’ve looked up Morrish & Co, London W1, and the only possibly relevant company made stationary, bags and then shop fittings – so perhaps they made the label, rather than the dress? I then Googled ‘Morrish & Co 56 Great Titchfield Street’ and the first result was for a company called Morplan. Morplan are suppliers to the fashion industry – they provide labels, ticketing, bags and hangers amongst numerous other bits and pieces essential to clothing retail and manufacture. The ‘About’ page of the website informed me that the ‘Mor’ part of the name was taken from Mr Morrish of Camberwell, SE London who founded the company in 1845. They operated using the names ‘Morrish and Chalfont’, ‘ Morrish & Co.’, ‘Morrish’ and finally ‘Morplan’. They have been operating from Great Titchfield Street, W1 since approx. 1894. So there’s one mystery pretty much solved: Morrish & Co. made the labels NOT the dresses. I’m not sure how much of this is common knowledge within dress history and vintage circles but it is clearly a red herring that catches many vintage sellers and students like me out. As one mysterious case closes, another one has opened: who made the green ‘Sunday Best’ outfit? I can see this turning into a mammoth trawl through the Hodson Shop Archive. I’ll let you know when I find anything out! I’m also now beyond intrigued in the history of Morrish & Co. and their links with the fashion industry. Please let me know if you are aware of any research on them. I’ve never really stopped to think about who makes the labels in my clothing, they are one of those small and largely ignored parts of everyday life and dress. There’s a nice project in that somewhere! 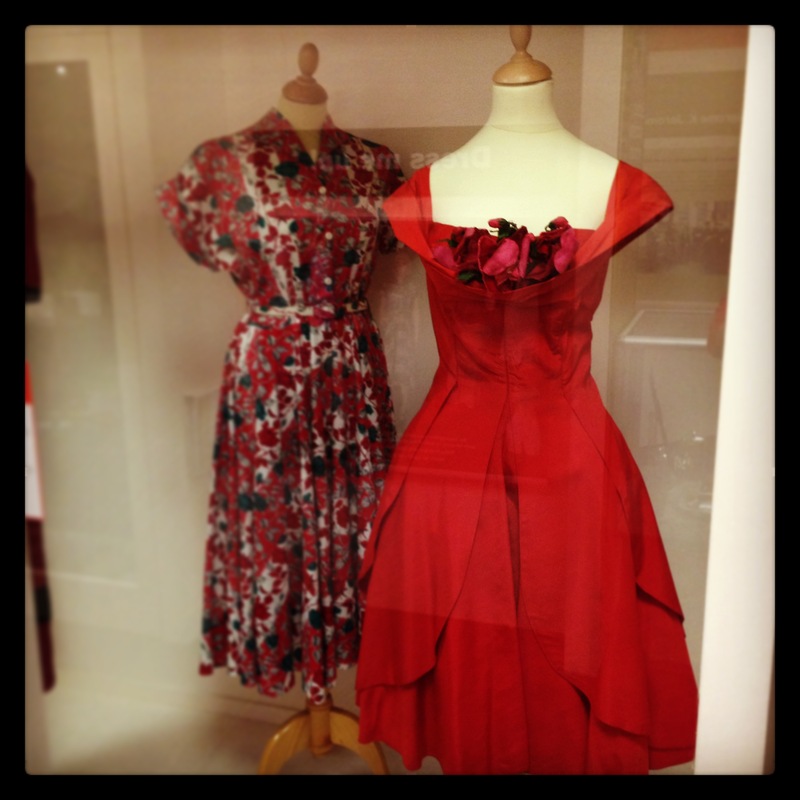 From left: printed cotton day dress, c.1951 (Hodson Shop Collection), red grosgrain short evening dress with roses, c.1958. Sometimes it is the simplest ideas that prove to be the most effective, as evidenced by Walsall Museums latest dress exhibition: Red! As you might have figured from the title, the exhibition is a celebration the colour red, most specifically the iconic red dress. All of the dresses have been drawn from Walsall Museum’s massive costume collection and include several items from the Hodson Shop Collection. The dresses are organised in chronological order, starting with this stunning striped muslin day dress from the 1850s (pictured below) and working their way up to this slinky satin wrap dress from the early 1990s (I love the fact that this dress is from Etam). And somewhere in the middle is this grosgrain Wishick and Webber stunner from 1958 (pictured top right). White muslin day dress with red stripes and dots, c.1855. Hodson Shop dresses include a 1920s cotton day dress with a pointed collar and daisy print, aCC41 (utility) rayon crepe dress with a belt and button details and a 1950s floral print day dress, scattered with stripes and roses (pictured top left). Even though the Hodson dressed are far from the glitziest items on display, they certainly manage to hold their own amongst the frills and flounces. The visual impact of the colour is undeniable, whether the dress is a glitzy beaded flapper number or a simple utility dress. It is a great starting point for planning outfits for the upcoming party season! Red! runs until 18th January 2014 at Walsall Museum, Changing Face of Walsall Gallery on the first floor of the Walsall Central Library building. Admission is free! See What’s On Walsall for more details. Since starting this project, I’ve spent a lot of time thinking about dirt and decay. Most specifically the importance of dirt in creating a ‘biography’ for museum garments and the curatorial and conservational challenges it poses. Here’s the deal: when the Hodson Shop Collection was first discovered, it was dirty. Years of accumulated Black Country grime had taken its toll and left garments smeared with sooty smudges. Yet the decision was made to preserve this grime where possible as it was considered an important part of the collection’s story. In the absence of a conventional ‘story’, i.e. one that involves someone actually wearing the garments and leaving traces and imprints of wear (this could be a scent, creases or marks), such a decision makes sense. Fashion historians and costume conservators often talk of ‘sacred dirt’ – a lipstick trace here, a spot of blood there. These are marks that are integral to the story of the garment and must be kept intact. There are some quite touching and intriguing examples of ‘sacred’ dirt within the Hodson Shop Collection. My personal favourite is the 1930s vest that features two small cat paw prints. I love the idea of a cat crawling over the piles of unsold underwear before snuggling down to sleep on a pile of knickers! So, yes, I find dirt very interesting! But do museum audiences share my interest or do dirt and decay present insurmountable barriers for museum visitors? How can dirt and decay be presented to museum visitors? And at what point does a dirty and decayed item become unexhibitable? This brings me on to what I have decided to call the ‘Tinkerbell’ dress (pictured above). The name comes from the fact that it is A) green and B) falling into a state of fairy-like shredded decay. It is an item that inhabits a state of limbo, being at once inside a museum but not part of the museum’s collection. It is a beautiful pale green silk-chiffon dress from the 1920s that was found amongst the Hodson Shop stock. 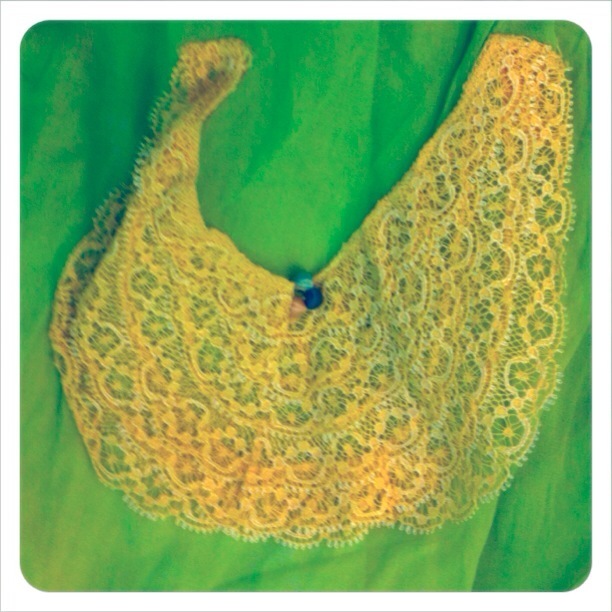 It has long lace-trimmed sleeves, a high lace collar and pretty scalloped pockets made from tiers of lace. 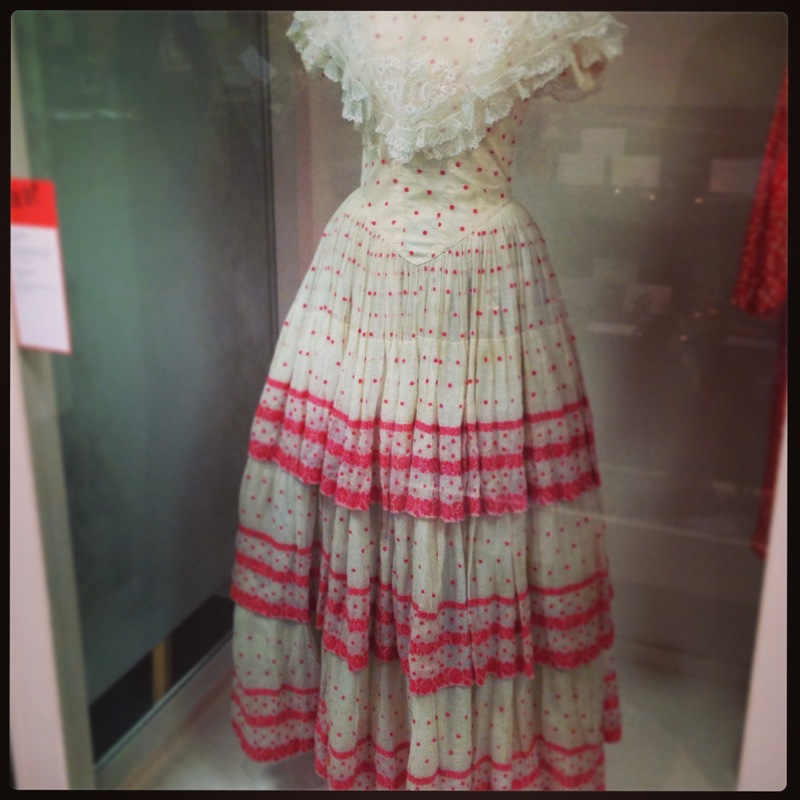 I’m was initially quite surprised that the dress was from The Hodson Shop, mainly because it is silk, very bright and involves intricate detailing – such as the clusters of tiny silk wrapped balls that sit on the lace pockets. 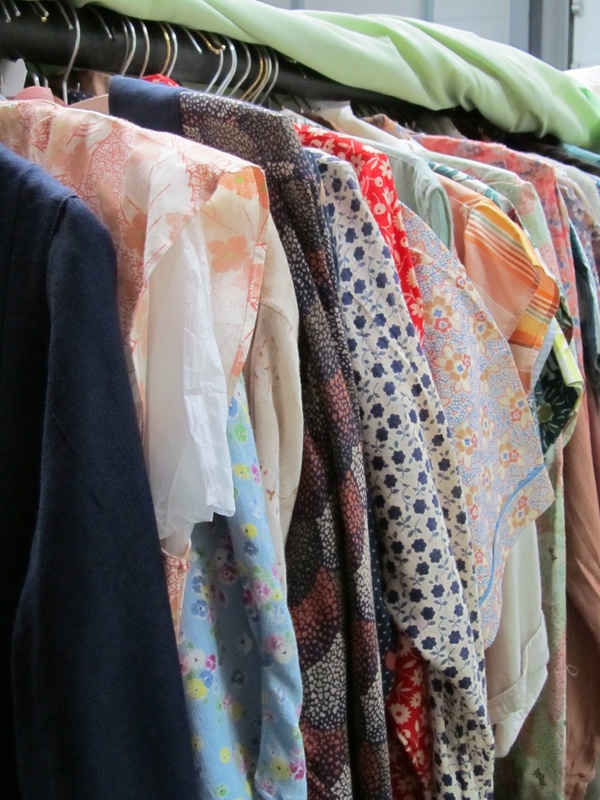 Most of the early Hodson Shop dresses are cotton or man-made fibres, fairly drab and simple. Sheila Shreeve believes that the dress may have been bought in especially for a friend or family member, thus explaining these differences. The pocket detailing – note the cluster of small silk-wrapped balls. The dress was discovered in such poor condition that it was decided not to accession it into the Hodson Shop Collection. The silk is shattered and shredding – so much so that I was terrified to move the dress to take a picture (hence the far from ideal images above – I’ll attempt to get a better one when I am next at the museum). Whilst this decay is sad, the dress is beautiful. It was this thinking that lead to the inclusion of a shattered and fragmentary dress in the exhibition. It was laid flat – with its damage and decay exposed to visitors. It was ‘the unexhibitable exhibited’. 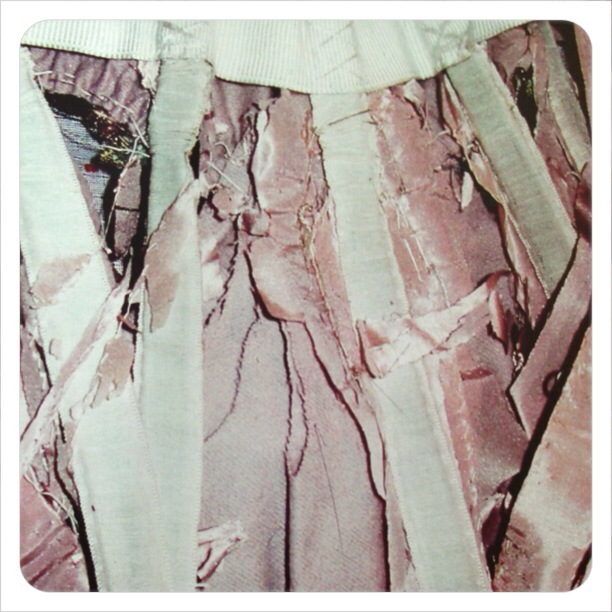 Interestingly, an image of a shattered corset worn by Maud Messel was used as the invite for de la Haye’s lecture (see below), suggesting that decayed garments can often make a lasting impression upon on those who come into contact with them. Unlike the shattered Messel dress, the Tinkerbell dress has not been worn and it is not attached to an illustrious family of aristocratic fashion collectors. Maybe it is wear and attachment to a personality that make signs of decay palatable to museum visitors – are they what enable the unexhibitable to be exhibited? Whilst the Tinkerbell dress is unlikely to ever be exhibited or accessioned, it has provided me with a lot to think about. I feel very lucky to have experienced this dress in all of its magic frailty.